Back in October, just as tickets were first going on sale for Star Wars: The Force Awakens, AMC Theatres announced Star Wars Sundays. Fans who attend IMAX screenings at the theater chain will get to take home a different IMAX poster from Star Wars: The Force Awakens each Sunday between December 20 and January 10. Earlier today, the theater chain debuted the third poster in this series, which features Gwendoline Christie's Captain Phasma. In Star Wars: The Force Awakens, Captain Phasma is a First Order officer, whose name was an homage to the 1979 classic Phantasm, which director J.J. Abrams is a huge fan of. Phasma is one of many First Order characters in the movie, whose fates have not yet been officially revealed. It is believed that she, along with Kylo Ren (Adam Driver) and General Hux (Domhnall Gleeson) were among the few First Order members to make it off the Starkiller Base alive, but we don't have any confirmation what happened after the big explosion, and probably won't until closer to the release of Star Wars: Episode VIII. Producer and LucasFilm boss Kathleen Kennedy has confirmed that Phasma will return in Star Wars: Episode VIII, which starts production in 2016 under the direction of Rian Johnson. The director has already shot a few key scenes at Skellig Michael Island in Ireland, but principal photography won't begin in earnest until sometime this spring. Hopefully we'll get a confirmed cast list for this highly-anticipated sequel soon, so we can find out who is returning and who may or may not have been cast aside. We reported earlier today that Star Wars: The Force Awakens became the fastest movie to earn over $100 million in IMAX theaters, achieving the milestone in just 12 days. The previous record-holder, Jurassic World, took 18 days to reach $100 million in the IMAX format. With the promise of new posters every Sunday at AMC Theatres IMAX showings over the next two weeks, Star Wars: The Force Awakens' IMAX grosses will surely keep increasing. In addition to this new poster, you can also check out the first two one-sheets released through AMC Theatres' Star Wars Sundays initiative. Star Wars: The Force Awakens has earned just over $540 million in all domestic theaters so far, with an overseas gross of $598.7 million, making it the fastest to cross $1 billion worldwide in cinematic history. Within the next few weeks, Star Wars: The Force Awakens will most likely surpass Jurassic World's $652.2 domestic total to become the biggest movie of the year. 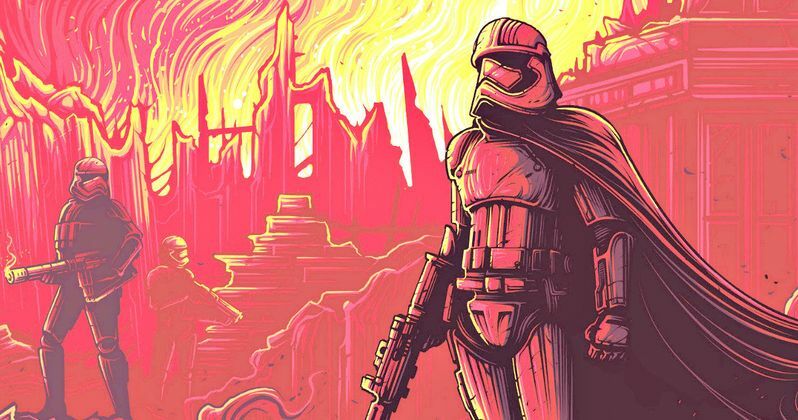 Take a look at these posters, and stay tuned for more on Star Wars: The Force Awakens.